It seems like everyone is talking about ‘digital’ these days – digital assistants, digital data, digital marketing, digital art, digital footprint. We’re increasingly reliant on digital devices – smartphone addiction, anyone? – and the need to be constantly connected. On a flight recently, there was a passenger a few seats away from me having a mini-meltdown because the onboard WiFi wouldn’t be available for the entire flight. 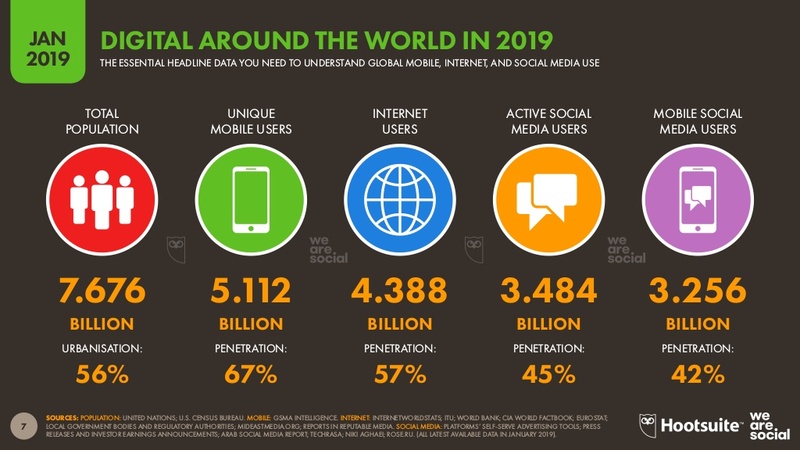 According to the Global Digital 2019 reports from We Are Social and Hootsuite, the digital world shows no signs of slowing down. In fact, the number of internet users around the world is growing by an average of more than one million new users every day! The research, published earlier this year, reports a 9.1% increase from last year, bringing the number of internet users to 4.388 billion. 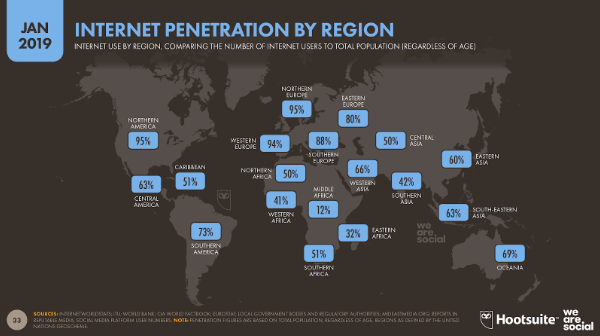 In areas like Northern Europe and North America, 95% of the population are online. It’s likely no surprise that of those internet users, 84% searched online for a product or service to buy, 91% visited an online retail store on the web and 75% purchased a product or service online. The growing number of mobile users (up 100 million from last year) is reflected in the fact that 55% of internet users had made an online purchase via a mobile device while only 42% had done so from a laptop or desktop computer. With so many consumers researching and purchasing goods and services online, it’s important for companies to provide the right service and support online as well. According to Frost & Sullivan, US companies are losing more than $83 billion annually due to poor customer experiences. On the flip side, they also found that 74% of customers have spent more with a business due to a history of good service. Organisations everywhere are taking on digital transformation projects and searching for the best way to join up digital channels with more traditional customer contact channels. Implementing and executing successful digital customer experience (CX) initiatives is crucial for companies, particularly those in regions where a majority of the population are internet users. Offering a seamless and efficient CX that delivers consistent and reliable information to consumers regardless of whether they self-serve or talk to a contact centre agent has a direct impact on a business’ bottom line. Companies must also consider the popularity of other touchpoints, such as messenger apps and smart speakers, with their target customers as they evolve their digital strategies. Some organisations like Rest, one of Australia’s largest superannuation funds, are using a virtual agent across multiple channels – including Google Home – to successfully engage a customer base of digital natives. 57% of the world’s population are now online, and the number of internet users is growing every day. Is your organisation positioned to stay competitive in an increasingly digital world? Humans – and companies – are creatures of habit and often resistant to change. While the ‘but it’s always been done that way’ reasoning makes for a relatable and compelling TV show, it can spell disaster for organisations when they resist recognising changes in customer behaviours and preferences. Blockbuster has become a posterchild for missed opportunity, passing on the chance to purchase Netflix and then trying to get into the streaming trend too late, which ultimately led to the company’s demise. When it comes to customer experience, organisations can’t afford to ignore the impact technology is having on the way we communicate with each other and with brands. Today’s highly connected digital customers are looking for 24/7 access to information and support across multiple channels and devices. They want a seamless experience that is personalised, consistent and easy. Companies like Amazon are often applauded for their superior customer experience, and customers are now expecting that same level of service from all the organisations they engage with, regardless of industry. As consumers increasingly turn to self-service and digital channels, organisations need to analyse the changing preferences of their customer base and look to incorporate new channels and technologies into their customer support strategy. The change to self-service needs to happen in conjunction with an evolution of the contact centre. Current capabilities of AI-powered chatbots and virtual agents put these solutions in the perfect position to be complementary with the contact centre and live agents. While some sceptics talk about chatbots and virtual agents in the customer service space as a passing fad, the reality is that they are a tried and tested tool for providing digital self-service and are helping to define the future of customer engagement. Since the days of the early chatbots, these tools have improved greatly in their conversational abilities thanks to advances in natural language processing (NLP) and artificial intelligence (AI). The evolution of customer expectations has also driven massive amounts of innovation in the technology to allow for flexible back-end integration, easier maintenance and a reliable hybrid approach to self-learning. Take the first step toward meeting the expectations of digital customers with chatbots by requesting a demo to see this technology in action. Change can be hard, but smart organisations (and midwives!) know it is the way forward. Happy Customer Service Week! Each year the first full week of October brings the week-long international celebration of the importance of customer service and the people who operate by the motto ‘Nobody puts the customer in the corner’ by providing great customer service every day of the year. From those who provide face-to-face service to those working in contact centres to those responsible for supporting self-service channels, delivering quality customer service is a team effort, and we salute you all. The Future of the Contact Centre – Technology is altering the way customers engage with brands and increasing their demands for instant 24/7 customer service. The traditional model for call centres and contact centres is no longer providing the experience customers have begun to demand. As organisations look to meet the expectations of digitally-savvy customers, changes in the contact centre and the job descriptions of customer service agents are going to be key to digital transitions. Live Chat vs. Virtual Agents: A Story of Overcoming the Divide to Work Together in Perfect Harmony – In the not too distant past it wasn’t uncommon to come across organisations struggling to decide between live chat or a virtual agent on their website for customer support. However, now the either-or debate is changing into a discussion of how to bring these two technologies together to work in perfect harmony. Organisations that continue to view them as stand-alone tools instead of complementary solutions are going to struggle to provide quality digital support experiences for their customers. CX in 2017: A Tale of Empowered Customers, AI and Self-Service – According to Forrester, companies are under attack from their customers with technology-empowered customers deciding the winners and losers. The analysts at Gartner have also been following these technology-driven changes in customer preferences and predict that by 2020 the use of virtual customer assistants (also called virtual agents or chatbots) for providing better customer service will increase by 1,000%. Knowing you need to offer digital self-service and successfully implementing these tools as part of your overall customer service plan are two very different things, though. The best way to start is by educating yourself about digital engagement solutions and customer expectations. Conversational Commerce for Demanding APAC Customers – The Asia Pacific region had been seeing the change to self-service happening separately from the contact centre which then created new challenges for companies. Now contact centre professionals are coming to understand that virtual agents and chatbots can work together with contact centre agents and are seeing the benefits of including these conversational systems as part of their overall customer service plans. Is the Contact Centre Part of Your Digital Transformation Programme? – Every organisation is in the midst of digital transformation programmes and the contact centre needs to be a key part of that, although that’s not always the case today. In the future, the contact centre will be the centre of excellence for the knowledge used across customer support channels and organisations need to put the necessary tools in place to facilitate that change. Infographic: Are Chatbots and Artificial Intelligence Threats to Your Contact Centre? – Some academics and experts are warning about the dangers of AI, predicting everything from a huge loss of jobs to the end of the human race. At the same time, industry analysts are predicting significant increases in chatbots and virtual agents in the customer service space. This infographic gives a realistic overview of the impact of AI, chatbots and virtual agents are having on the contact centre. Is the Contact Centre Part of Your Digital Transformation Programme? I say this every year, but the Technology Innovation Showcase webinar Creative Virtual does with CRMXchange is one of my favourite webinars to present. This was the fifth year running that we’ve participated in the webcast series, and it was our most popular one yet with a record-breaking number of registrations. I love this webinar because it gives me a chance to share more live demonstrations than slides, and I know the best way to understand how our technology works and what it can do for customers and organisations is to see it in action. For this year’s Showcase, I focused on the theme of ‘Chatbots, Virtual Agents and Your Contact Centre’. There’s so much buzz and hype, as well as unrealistic expectations and disappointments, around artificial intelligence (AI) and chatbots that it can be difficult to know how best to deliver, implement and support these types of solutions. My goal during the webinar was to showcase best practices in deploying chatbots in conjunction with human assistance for customer support and sales. I selected my demonstrations specifically to show how the virtual and real can work in perfect harmony to meet business objectives. Artificial intelligence on its own is not the answer for customer support. Companies like Microsoft and IBM have been responsible for setting false expectations in regards to how AI can be deployed for customer service. Chatbots and virtual agents should blend human curation of content with machine learning. This hybrid approach enables the system to continually improve while also allowing control over the reliability of responses. Every organisation is in the midst of digital transformation programmes and the contact centre needs to be a key part of that, although that’s not always the case today. In the future, the contact centre will be the centre of excellence for the knowledge used across customer support channels and organisations need to put the necessary tools in place to facilitate that change. By including the contact centre as part of this transformation instead of allowing it to become a siloed and outdated entity, it benefits from lower costs, reduced staff turnover and more engaged, skilled and happier agents. Customers are starting to specifically demand chatbots for digital self-service, with research showing that many would choose to interact with a chatbot before a human to get instant answers. To meet the demands of customers, organisations need more than just chatbots and virtual agents that are available 24/7 though. Over the past several years providing an effortless way to interact with your company has become more and more important. Instead of offering a wide range of support options for customers to choose from, you need to offer one place for customers to ask a question and for that system to be the intent matcher. Then, once you understand the intent, immediately provide the most appropriate method for assistance. You also need to provide a seamless experience that’s available on any device, can easily switch between languages and provides personalised responses. I invite you to watch the recording of the webinar on-demand to understand more about these three points and to see the live demonstrations of chatbots, virtual agents and live chat solutions that are currently being used by some of our customers around the world. My thanks to Sheri Greenhaus and CRMXchange for organising and hosting another successful Technology Innovation Showcase for us. I’m already looking forward to presenting again next year. https://www.creativevirtual.com/wp-content/uploads/2017/09/Contact-Centre-blog.png 494 1000 Mandy Reed https://www.creativevirtual.com/wp-content/uploads/2017/12/site-logo.png Mandy Reed2017-09-15 09:45:162018-05-16 18:05:42Is the Contact Centre Part of Your Digital Transformation Programme?